Low cost automated lubrication system timer. 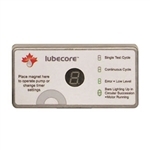 Lubecore MKII Automated Lubrication system timer. Used in Dual system operation. 1 pump - 2 timer ALS systems. 12V/24V Timer replacement assembly for pneumatic and electric parallel EP0 automated lubrication systems. 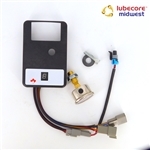 Lubecore MKII Automated Lubrication system timer for mobile heavy equipment. Lubecore "Front Mounted Timer" for Pneumatic pump automated lubrication systems.